Here is the amount of morning light you need to get to reduce body fat and BMI. People exposed to bright morning light have less body fat, a new study finds. They also have lower BMIs compared to those exposed to light later in the day. This conclusion comes from research presented at the SLEEP 2015 conference (Cheung et al., 2015). Other studies on exposure to morning light have also found similar results. 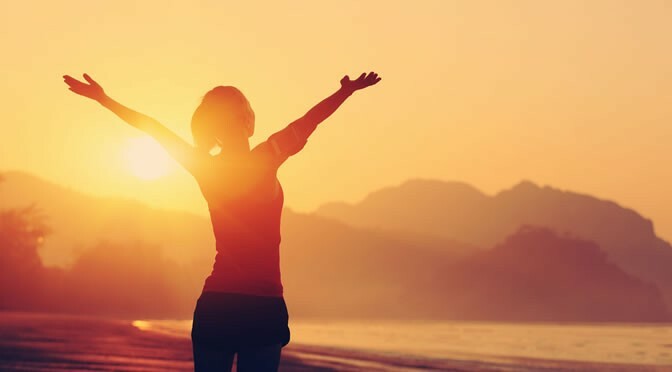 For example, one study found that the effect of morning light exposure on body weight accounted for about 20% of a person’s BMI (Reid et al., 2014). This finding was independent of factors such as season, individual’s physical activity level, age, sleep timing, and caloric intake. “Light is the most potent agent to synchronize your internal body clock that regulates circadian rhythms, which in turn also regulate energy balance. If a person doesn’t get sufficient light at the appropriate time of day, it could de-synchronize your internal body clock, which is known to alter metabolism and can lead to weight gain. Only about 20 to 30 minutes of morning light is enough to affect BMI. “Many people do not get enough natural light in the morning, because the American lifestyle is predominantly indoors. We also work in poorly lit environments, usually about 200 to 300 lux. In the study, 500 lux was “the magic number” or minimum threshold for having a lower BMI. Even on a cloudy day, outdoor light is more than 1,000 lux of brightness. It is difficult to achieve this light level with usual indoor lighting”.